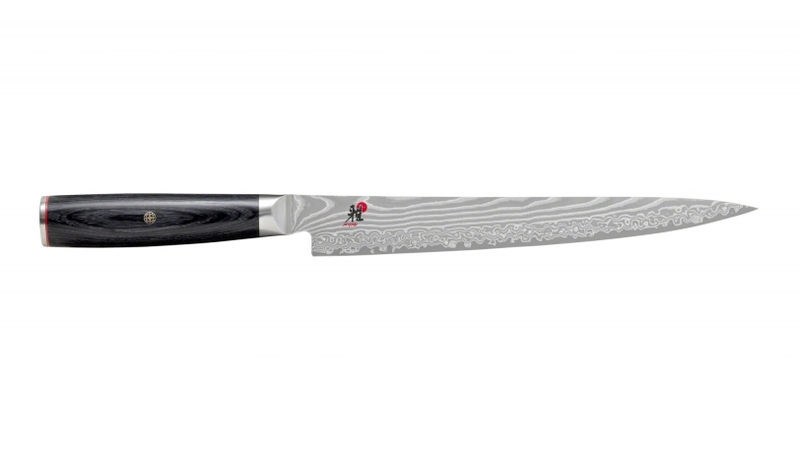 This high-quality Sujihiki knife has an authentic Japanese blade profile and a strikingly beautiful damask design. The manufacture of the blade is characterised by the use of the highest quality special steel, which has a high carbon content. The core of the blade consists of an FC61 fine carbide steel layer that is embedded in 48 layers of damask. The FRIODUR® ice hardening refinement process guarantees you a blade with special hardness, excellent flexibility and corrosion resistance. The razor-sharp cut is produced via a traditional grinding process, which is carried out by hand with the finest natural grindstones to produce the two-sided Honbazuke trigger. The traditional and shapely D-handle of the knife is made of Pakkawood, which is not only visually appealing, but extremely durable. It also ensures increased slip resistance during cutting work. The ergonomic handle and the hard yet flexible blade results in optimal balance of the knife, which ensures fatigue free working.